The Public Works Department of the City of Lima is charged with the most diverse range of responsibilities of any city department. The Public Works Department addresses the physical needs of the city including everything from snow plowing to issuance of taxi licenses. This department is comprised of four divisions: Engineering, Building and Zoning, Streets and Parks, Recreation, and Forestry. It is only through the resources and support granted by the taxpayers of Lima and the efforts of many dedicated employees that the department is able to provide the myriad of services that make this city an enjoyable, healthy community in which to live. Roadway improvements including landscaping, wide sidewalks between the parks and roadway lighting. The Elm RRGS Project began in May, 2018 and has a target completion date of November, 2019. For the latest in construction projects and any business/traffic updates, please visit GoLima.org. A draft copy of the City of Lima's American with Disabilities Act (ADA) Transition Plan can be found HERE. In conjunction with the Allen Soil and Water Conservation District, the City of Lima is promoting a new program which encourages Lima residents to plant trees on their property. The City of Lima Tree Rebate Program is open to City of Lima residents and offers a 50% rebate to eligible participants. There is a limit of 2 rebates for newly planted trees per residential parcel, per calendar year. 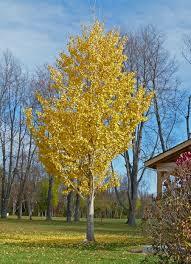 Eligible tree sizes are limited to 1.5" - 3" diameters and must be one of the sixty-nine approved tree species. 2018 marks the third year for the program as it launched in March and will carry thru November with reimbursement money available from the city's Stormwater Engineering Department. For more information, see their FLYER (PDF). The Allen Soil and Water Conservation District is partnering with the City of Lima and Keep Allen County Beautiful to expand the Adopt-A-Roadway Program. Stormwater Program Coordinator, Beth Seibert reports that "litter has a significant impact on water quality in local streams such as the Ottawa River", and in her mind "this type of pollution is easy to solve". 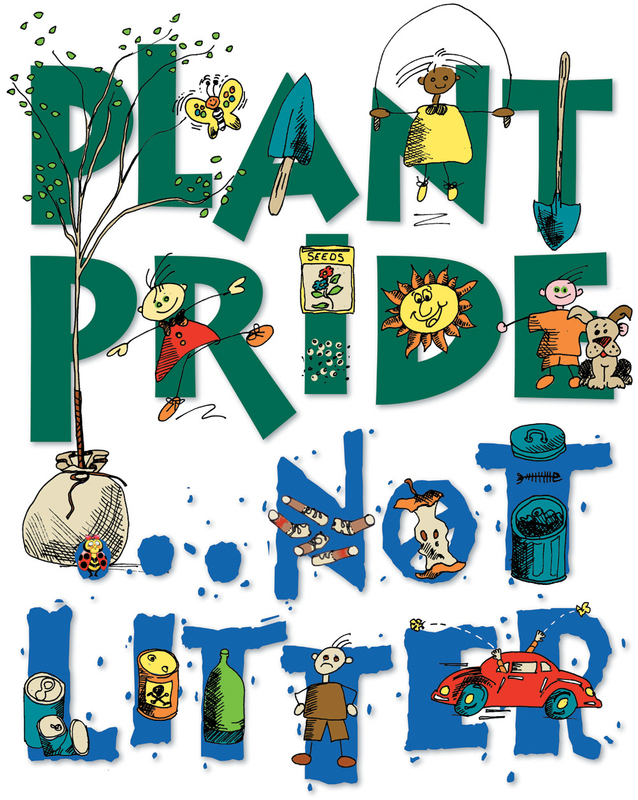 Within the City of Lima they are looking for groups, families and individuals to adopt specific sections of streets, neighborhoods and parks and conduct litter clean-up at least twice a year. Groups will be provided with trash bags, gloves, and safety equipment. The City plans to install signage at each location giving credit to the sponsoring group and hoping to inspire others to get involved and do their part. Twenty different groups are being sought at this time so that everything can be in place when Spring arrives and the first cleanups can be conducted. To obtain more information email Beth Seibert or 419-223-0040, ext.107. 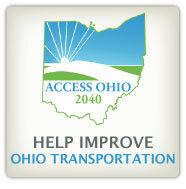 Help i mprove Ohio transportation by joining Access Ohio 2040, Ohio's Long-Range Statewide Transportation Plan. This site will allow you the opportunity to provide input into the Plan. Sign up now and start contributing. UPDATE - Jan. 18, 2017: As part of ODOT's Access OHIO 2040 campaign, ODOT is coordinating efforts with local jurisdictions to designate Ohio's first US and State Bike Route Network. This network will be similar to the interstate and state route systems of highways. ODOT intends to have five (5) US bike routes and 18 state routes. ODOT's intent is to complete the designation of the routes during the spring of 2017. Once designated, ODOT will identify the routes on their website and may eventually place signs along the routes at no cost to the city. For Lima, USBR 25 would follow the Ottawa River Bike Path from corporation line to corporation line. The Mayor has authorized legislation to enact a resolution supporting the establishment of USBR 25 which will seek Lima City Council approval on Jan. 23, 2017. Click HERE for more information on the program. In May of 2016, the Lima City Council approved a resolution to support the Public Works Department in the design of pedestrian and vehicular safety. View a copy of the Resolution Supporting the City of Lima Complete Streets Policy (PD F). The City of Lima continues to make strides in providing pedestrian alternatives to transportation. By design, these roadway features will help increase pedestrian thoroughfare through major routes. Future projects will continue to reflect our efforts of providing an adequate and safe route for bikers, walkers and alternative modes of transportation. Visit ODOT's Cycling Smarter Guide (PDF) for valuable information! "SHARROWS" are pavement markings that designate a shared route between cyclists and motor vehicles. Cyclists shall travel in the same direction as the motor vehicles along these routes. Even where there are no Sharrow markings, motorists are reminded to give bikes (and pedestrians) 3 feet of clearance - it's the LAW! BIKE LANES have been added along select roadways and designate exclusive use by bicyclists. The lanes are intended for one-way travel in the same direction as the adjacent traffic lane. In 2016, the League of American Bicyclists designated the City of Lima as a Bicycle Friendly Community at the Bronze Level. This award is presented only to communities with strong commitments to bicycling. Since the designation of the award, the City of Lima continues to make strides in the development and advancement of bicycle (and pedestrian) safety and access to routes. This honor reflects the great strides that Lima has been making towards becoming a bike friendly community. 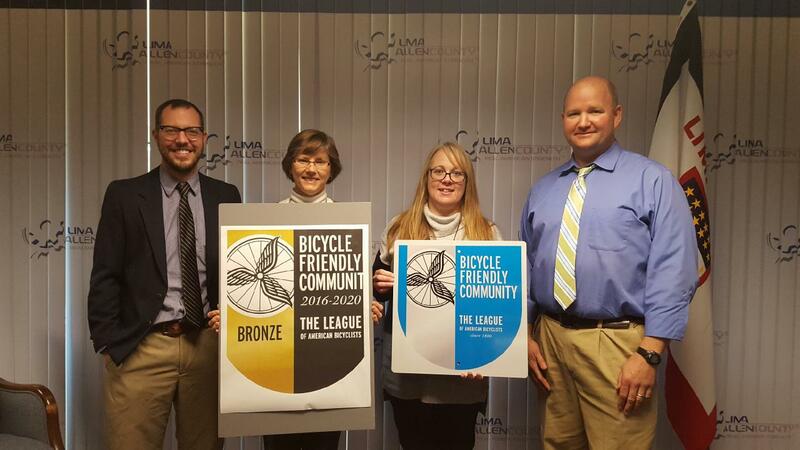 Congratulations to the following entities whose hard work and endless efforts helped make this recognition possible: the City of Lima's Public Works Department, Lima Police Department, Allen County Bike and Pedestrian Task Force, Allen County Public Health, Activate Allen County, the Lima Allen County Regional Planning Commission, and of course the cyclists of Lima.